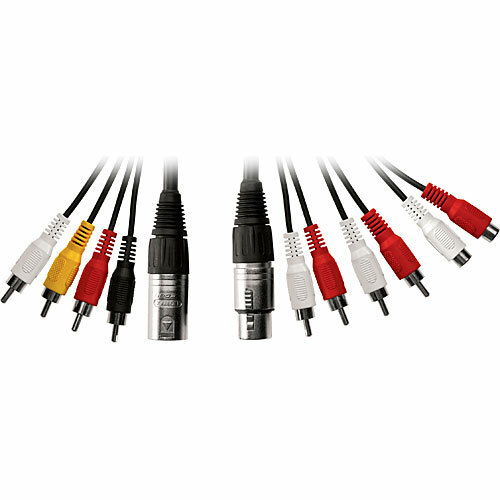 Native Instruments Traktor Scratch Multicore Replacement Cable DJParts - All Variety of Parts that DJ Needs. The TRAKTOR Scratch Multicore Cable - Replacement Cable from Native Instruments is designed for maximum plug-and-play usability with two color-coded connector cables grouping all necessary connections into one pro quality audio cable. Two sets of cable are included. The first is the "Mixer Segment" cable that connects a turntable or CD player with the mixer segment. The cable consists of a single female XLR connector on a 4 ft (120 cm) cable, terminated in four RCA male and two RCA female connectors. The second part is a cable of similar length, but is terminated with a male XLR at one end, and four RCA male connectors at the other end, and is used for connecting the mixer segment to the Audio 8 DJ.